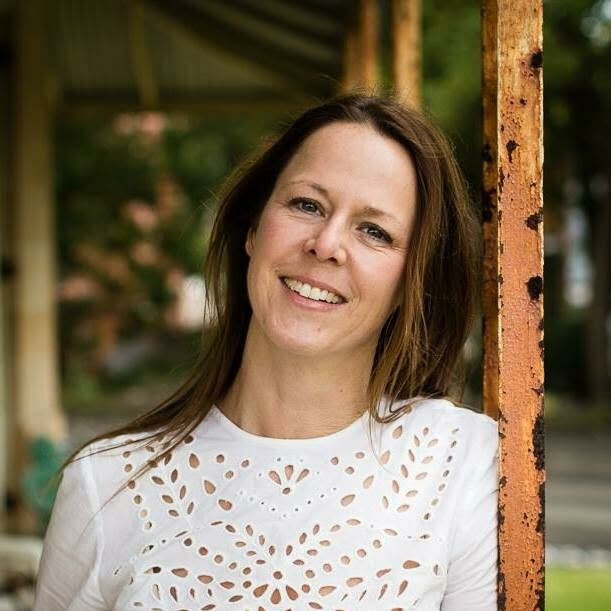 My guest author this week is Elizabeth Mary Cummings, a British author based in Australia who writes, advocates and speaks on storytelling and health matters for families and youth. She is a qualified primary school teacher and has worked in many schools in the UK, New Zealand and Australia. Elizabeth is a member of the American Psychology Association and studied psychology and business studies at The University of Edinburgh in Scotland before training to be a primary school teacher and traveling around the world with her family. She travels globally to talk about family and mental health matters as well as creative writing. 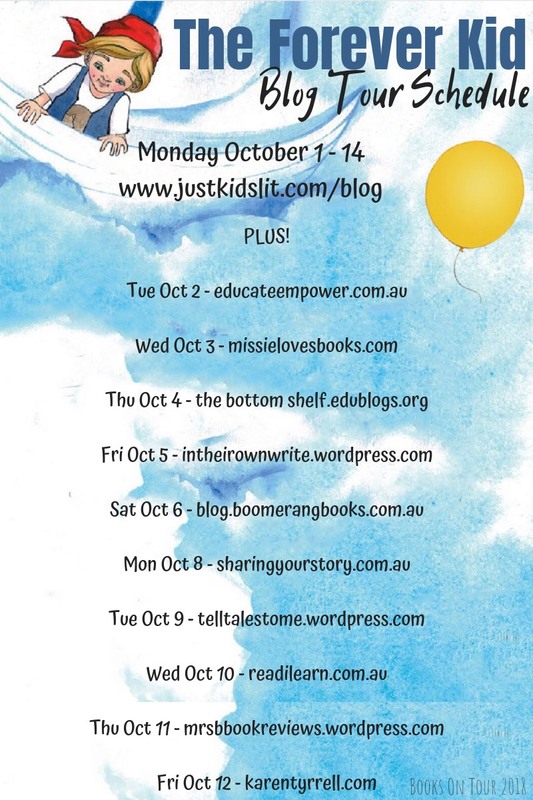 It’s my pleasure to chat with Elizabeth today as part of the blog tour for The Forever Kid, a sensitively written picture book about how one family deals with the loss of a loved one. The Forever Kid is a beautiful, moving book told with warmth and compassion. What was the inspiration behind it? I was inspired to write The Forever Kid in a lightning moment in the middle of the night a few years ago. My parents were visiting and we must have been talking about family and life the universe and everything. One night I went to bed and woke up with the whole story in my head. My dad is from a big family and the brother closest in age to him passed away as a teenager. I recalled as a child being very affected by this knowledge. I had been told that at the time of his death many of my grandparents’ friends had been inhibited by the sadness of my uncle’s early death and so had distanced themselves from my grandparents and the family rather than rallying round and supporting them. There seems to be a culture, certainly in the UK at the time, of not talking about family and mental health issues and not sharing emotion around tough times and topics. This stiff upper lip is not helpful and I just remember being so very sad at hearing the story about my uncle’s death and how it impacted my grandmother and the whole family. Around the time I wrote the manuscript I had been grieving for the loss of two very close friends and I do believe that this grief triggered my mind to start thinking about grief and loss in a wider sense. I also have some dear friends who have gone through extreme grief at the loss of their own children, their partners and in some cases their siblings. The grief and loss resonated with me in the context of where I was at in my own grief. Grief does not go away, it is real, it is always there and I believe it is too important not to talk about it and the loved ones for whom we mourn. Beautifully said, Elizabeth. Choosing to write about loss and remembrance in a picture book must have presented some challenges. What are your thoughts on tackling this topic for young readers? The challenge in writing a book like this is that the message has to be pure; it has to have integrity and it has to be honest. You cannot dress these topics up. Children can see right through that. Young children grieve and their loss and grief is no less significant than that of older children and adults. They need to have a safe space in which to talk about the grief. They need to have a close adult or older child to do this. They need to be included in the memorial process as well as in the events surrounding remembrance and death. Mental health education is a focus of your children’s books. Do you see it as more important now than in earlier times for parents to discuss these sensitive topics with their children and what role do you envision for your stories? No I don’t see it as more important now; rather I believe that it is only now that we as a society are beginning to understand how important talking about mental health is for our well-being. Our society has become more and more sophisticated, there has been almost a sanitising of the circle of life that has for a while cut off the pointy end, the part of our lives that is about dying and leaving this world. Where we are prepared to talk about birth and love in great detail, the full cycle of life has not been a subject that is easily talked about. I believe that is partly to do with the fear and mystery surrounding death. Whatever one’s religious or spiritual beliefs might be, one thing is certain: every human on this planet dies. It’s the one thing for sure we all have in common. Back in ancient times and in tribal societies children were involved in rites of passage in whole community engagement with life and death. That does not happen so much now but I think we are beginning to see the pendulum swing back towards recognising the value in including our young at these very important family times. How has your teaching background influenced your approach to writing for children? As a teacher I have had a lot to do with children and their lives. I have worked with children from a myriad of backgrounds. You get to realise that there is no ‘one size fits all’ approach to teaching and that each child has the right to be helped to discover their own potential in a safe environment. I am very mindful of these things when I write As well as very grateful that I have had the chance to help children both as a teacher and hopefully now through my writing. Tell us a little about your journey to publication. How did that come about? I have independently published a number of books before The Forever Kid was accepted by Big Sky Publishing. 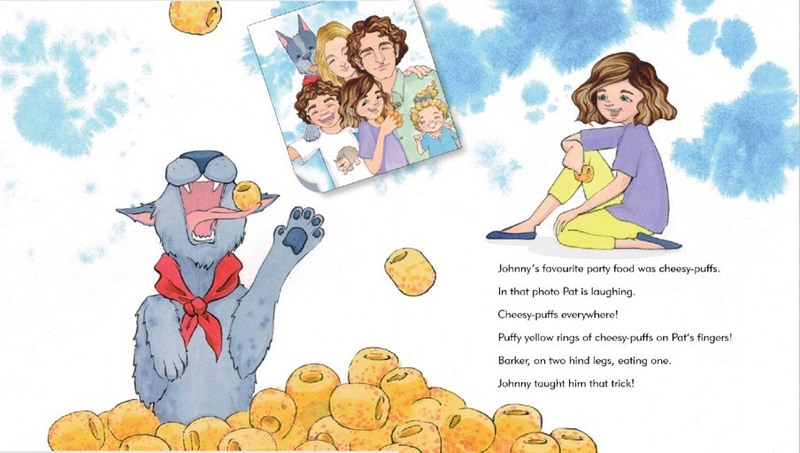 I had written the manuscript for The Forever Kid a number of years ago and had polished it before going for a manuscript assessment with the amazing Anoushka Jones from EK books at the 2016 kidlit fest. She loved the narrative and wanted me to submit it to EK which I did. Sales and marketing were unable to commit to such a particular style of book due to the fact that they were already publishing a number of books with heart at that time. So reluctantly they did not take my manuscript on, though apparently there was not a dry eye in the room when they all sat and read the manuscript! This was motivation enough to me to keep going. So I got advice from many different sources including large trade publishers like Sarah Munn from Lake Press and other publishers who all gave me direction. Andrew Wilkins from Wilkins Fargo suggested I speak to Big Sky Publishing which I did and the rest is history! How involved have you been in the development of your book? Did you have input into the cover, illustrations and book design? Yes. Big Sky Publishing have been very inclusive to me as a writer and sharing various thumbnails and asking my opinion at each stage about the cover and the final layouts. They have made it a very natural and ‘unscary’ process. What’s the best aspect of your writing life? I love connecting with other people and having the chance to share ideas and messages through the written word. —the worst? The worst part of my writing life’s is that I have so many ideas and projects it can be a challenge to keep up with myself! I can certainly relate to that, Elizabeth! What do you wish you’d been told before you set out to become an author? I’m not sure – maybe that I should’ve got on with it earlier in life than I have. We can all have self-doubt and will allow other aspects of our life to get in the way, but if you have that burning desire to write, action it sooner rather than later. What’s the best advice – writing or otherwise – you’ve ever been given? Best advice is not to compare yourself to anybody else, and not to compare your writing journey to that of anybody else’s either. You and your writing journey are unique. Your voice as a writer is important and does have a place, you just need to work out where that is. What’s your top tip for aspiring authors? Read, observe, write, repeat! How important is social media to you as an author? Social media is fairly important to me as a writer, however first things first. You’ve got to actually write! 1: Switch to another WiP for a while. 2: Go for a run/swim. 3: Change the music I’m listening to. In three words, how would you describe your writing? Intense, honest and accessible. If you had the chance to spend an hour with any writer of your choice, living or dead, who would it be and what would you most like them to tell you about living a writing life? Ooo, I love this question. I’d love a night on the town with Oscar Wilde. I’d imagine us drinking cocktails in cool little speakeasies and talking all sorts of nonsense until the morning before going off ‘Bunburying’ in the country in a very ‘Importance of Being Ernest’ manner! On a serious note I would love to know how he coped with much of the stigma against what he represented. I also reckon Mary Shelley would have proved a great partner in school chemistry labs! Can you imagine the experiments! A gentle story about loss, lasting love and remembrance that will move hearts. 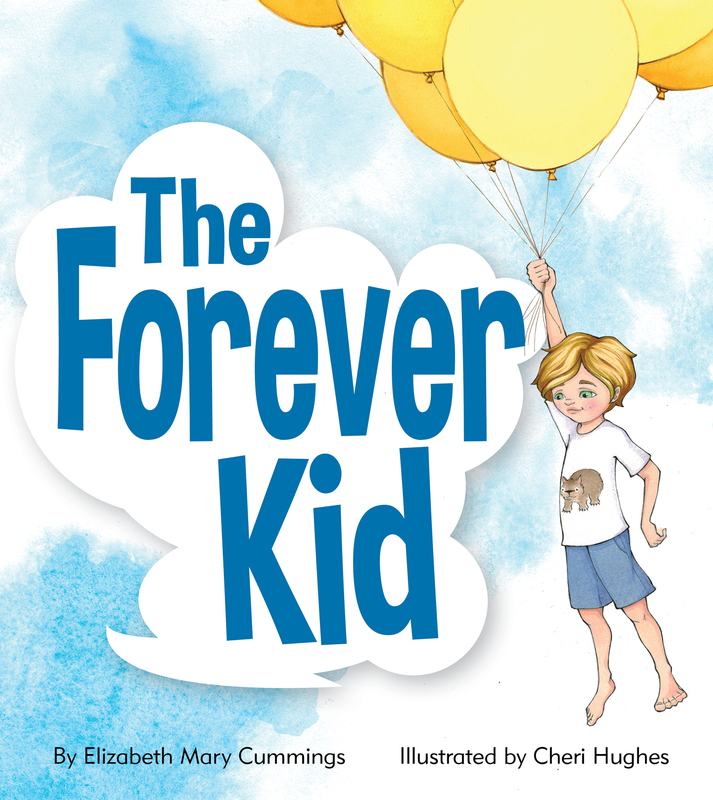 The Forever Kid is a powerful picture book tackling the complex subject of grief from a child’s perspective. The thoughtful, wise narrative and beautiful illustrations combine to sensitively explore the idea that loved ones are always connected even when relationships change. This story about the strength of family love is gently told and tenderly illustrated.